Photograph shows scene from Groundbreaking Ceremony for the new City Hall, June 12, 1962. 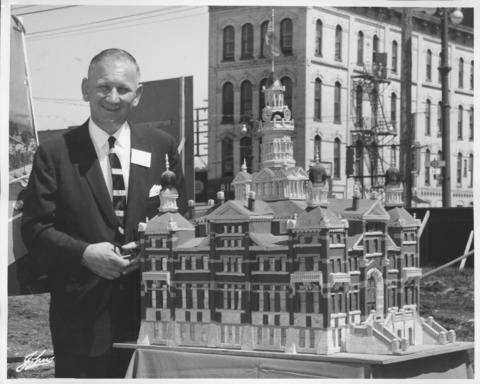 In foreground, Mayor Stephen Juba stands beside model of Winnipeg's second City Hall (1886-1962). - Stamp (on verso): John's Photo Studio, 555 Main St., Winnipeg, Man., Ph. WH 3-0259.